If you want an up-to-date monthly measurement of atmospheric CO2 concentration—my candidate for the most important leading indicator of welfare in the world—then I suggest you bookmark the home page of CO2now.org. The site gives you easy access to the longest running monthly time series of atmospheric CO2 concentration, which goes all the way back to March 1958. The American scientist Charles David Keeling pioneered the accurate measurement of CO2 after setting up a laboratory 3,000 metres above sea level at Mauna Loa in Hawaii. The location was specifically selected to eliminate sample contamination by large-scale factory emissions: no such industry exists for thousands of miles around Mauna Loa. As the years passed, Keeling’s observations showed a natural annual cyclical movement in CO2 concentrations: an upswing in the northern hemisphere autumn as vegetation died back and CO2 was released; and a downswing in the northern hemisphere spring as renewed plant growth removed CO2 from the air. The explanation for why the northern hemisphere growing season dominates the cycle is simple: 65% of the earth’s land mass resides in the north. The second observation was even more critical: atmospheric CO2 concentration was on an upward trajectory, a trajectory that has been dubbed the ‘Keeling curve’. 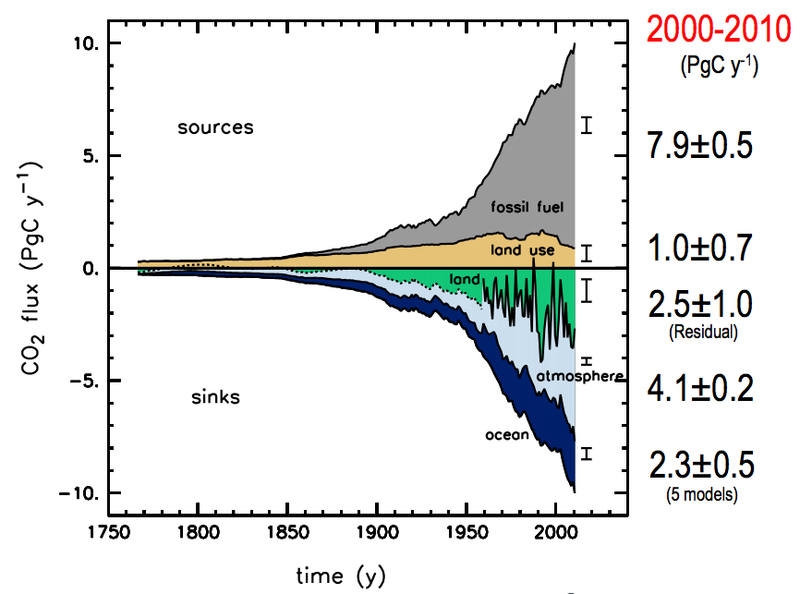 And as the years went by it became obvious that the source of this rising CO2 concentration was mankind. A few contrarians (most famously the Australian geologist Ian Pilmer) have suggested that undiscovered volcanoes are responsible for rising CO2 levels, but no mainstream volcanologists support his views; the consensus is that volcano sourced CO2 emissions are around 150 times smaller than those from anthropogenic (human) sources. An even more simple rebuttal to the ‘it isn’t us’ claim is that any serious alternative must account for where the CO2 from burnt fossil fuels has gone. We know to a high degree of certainty how much oil, coal and gas we are burning, and you can even go onto BP’s web site and look it up here. So if there exists some ‘natural’ source of the CO2 build-up, there must therefore exist a ‘natural’ withdrawal of all the fossil fuel CO2 emissions. Thus for it not to be ‘us’, an unidentified natural process must be removing all the human-produced carbon, while at the same time naturally produced carbon from a separate unidentified source is magically replacing it. I hope the absurdity of this logic is obvious. More interesting is the fact that annual fossil fuel plus land use change CO2 emissions don’t equate with the rise in atmospheric CO2 concentrations. There are certain numbers I encourage you to get comfortable with. One such number is the annual fossil fuel carbon emission as reported by the US Carbon Dioxide Information Analysis Center (CDIAC). The time series is reported here and the most recent advance estimates for the last two years are here. According to this source, 9.1 giga tonnes of fossil fuel carbon was emitted in 2010 (which is about 33 giga tonnes of CO2). The next number to etch into your memory is that 1 part per million (ppm) of CO2 in the atmosphere is equivalent to 2.1 giga tonnes of carbon. Keeping this figure in mind, look at the next two tables. They are taken from the Carbon Budget 2010 report published on December 5th by the Global Carbon Project (a body set up to coordinate academic research on the carbon cycle). Over the longer term, the percentage of emissions that remain in the atmosphere, the so called airborne fraction, has stayed around 43%. 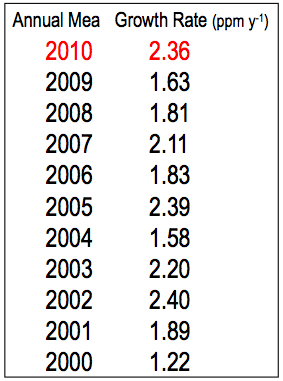 Thankfully, no change in trend for this fraction has yet been found (see here). Yet year to year there is a significant flux. For example, in 2010 we saw the airborne fraction at 50%, significantly above the 43% ish long-term trend. 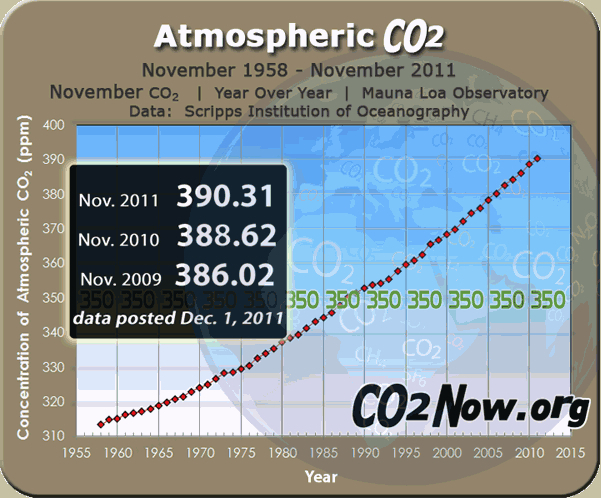 For the first 11 months of 2011, however, CO2 is up around 1.8 ppm year on year, which is equivalent to 3.7 giga tonnes of carbon. If we assume total emissions (fossil fuel and land use change) come in a little over 10 giga tonnes, the airborne fraction will have fallen from 50% in 2010 to somewhere around 35% in 2011. The main driver of this year to year shift is the El Nino Southern Oscillation (ENSO) cycle. Simplistically, cold water absorbs more CO2 than warm water, and during a La Nina phase you get more cold water and in an El Nino less. Unfortunately, just because the CO2 airborne fraction has been well-behaved to date, does not mean it will always be so. The fear is that at some stage carbon land and ocean sinks will become saturated, causing the airborne fraction to rise. Thus, more of the CO2 we pump into the atmosphere will actually stay there. Should that happen over the next few decades, then temperature rise could also accelerate. 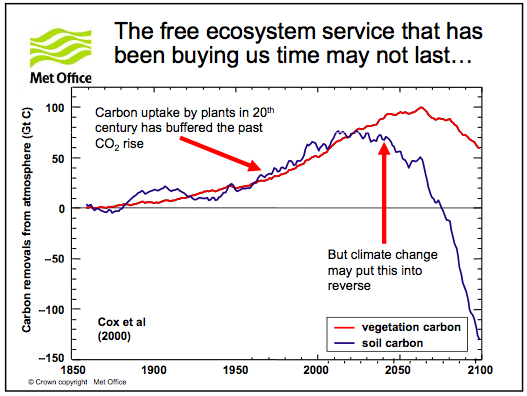 The UK Met Office has modelled one scenario which sees the Amazon rain forest dying off, so causing a massive down shift in the CO2 land sink uptake. 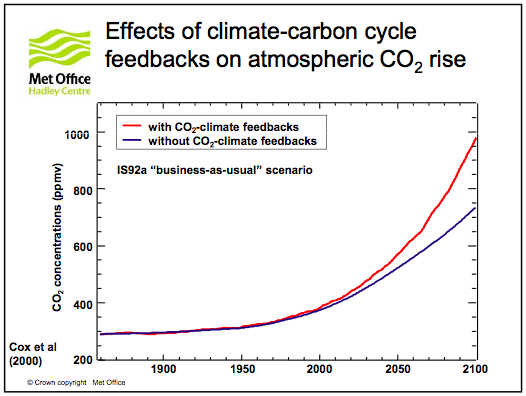 The result is a surge in CO2 concentrations. Thankfully, the Met Office model’s horrible looking carbon cycle feedback is still an outlier among climate models globally. That said, I make a habit of comparing CO2 emissions with atmospheric CO2 concentrations. We already have one instance of climate models failing to forecast a major structural shift: the far earlier-than-expected collapse in Arctic sea ice extent. Let’s hope the airborne fraction does not follow a similar path; but keep an eye on it just in case. 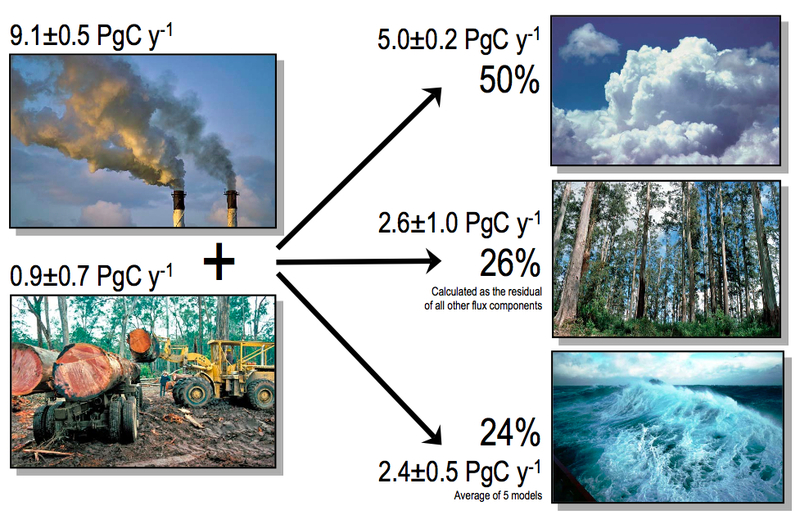 This entry was posted in Climate Change and tagged airborne fraction, Carbon Budget 2010, carbon sinks, charles keeling, co2now.org, Global Carbon Project, Mauna Loa, Met Office. Bookmark the permalink. An excellent presentation of the carbon cycle. However, as the oceans absorb the increasing quantities of CO2–even if they can do so without limit–they become ever more acidic with sever impacts on marine life–plants and animals alike. Ocean health is almost as crucial to our existence as is atmospheric health.